Here in the US, the term “Champagne” is often used loosely to describe a wine that has bubbles in it. “Are you bringing Champagne to brunch?” More than likely it’s Prosecco, or maybe Spanish Cava, but who cares, right? It’s all Champagne to most of us. Champagne only comes from one place: Champagne, France. And it ain’t cheap. The specific production technique, known as Methode Champenoise, is done with painstaking care; manually and slowly. Only the highest standards are allowed here. This is why you’ll pay big bucks (hundreds, for a famous brand) for a bottle of Champagne. Wouldn’t it be great if there were sparkling wines made to Champagne standards, but at more affordable prices? Well, great news! There are… and they’re made right here in America! Located in Wapato, Yakima Valley, Treveri Cellars is a family-owned sparkling wine house that now produces some of the finest handcrafted sparkling wines in the United States. Their wines have been served at White House State Department receptions and the James Beard Foundation in New York, and have scored many awards and high ratings over the years. Treveri's main facility is located in Wapato, in the dry, desert-like Yakima Valley. Treveri's vineyards are located in Wapato, in the dry, desert-like Yakima Valley. Winemaker Juergen Grieb, with son and VP of Sales, Christian. Christian checks on a cluster of Chardonnay grapes. Winemaker Juergen Grieb was born in the town of Trier, Germany and has a degree in both winemaking and sparkling winemaking. While attending wine school in the early 1980s, Juergen learned his craft with some of the best German Sekt (pronounced, “ZEKT”) producers of the day. After graduating, he scored a job with a German-based winery in Washington, where he worked for decades before setting out on his own. 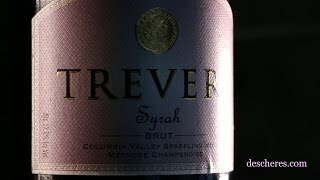 Juergen opened Treveri (During the times of the Roman Empire, Trier was known as, “Treveris,”) in 2010 with a mission to put Washington sparkling wine on the US map. As one of the State’s first dedicated sparkling wine houses, that meant, figuring out exactly what makes a Washington bubbly unique. He decided, it was about letting the purity of the grapes – more crisp, acidic and bright, in this region of the country – shine through without interference. Each wine is handcrafted in the French Methode Champenoise, using great care and attention, which produces some of the best sparkling wines you’ve ever tasted: All fresh, complex, yeasty and each one, characteristic of their respective grape. Made of 100% Chardonnay from the Yakima Valley this Blanc de Blanc (white wine, made from white grapes) features green apple flavor with a hint of brioche, balanced by bright acid and a touch of yeast on the palate for a cool, crisp finish. Pair this one up with oysters on the half-shell, grilled chicken breast with citrus glaze and white fish, like cod! A blend of Syrah and Chardonnay with a delightful color and a fruit-forward profile, this rosé is all strawberry, rhubarb, watermelons and spice with a hit of yeast on the nose. It would be great with a Prosciutto panini, salmon cakes with cilantro-ginger aioli and Salade Niçoise. An award-winning Sparkling Rosé that’s been served at the US State Department for 4th of July celebrations in 2012 as well as the Spring Diplomatic Receptions in 2014. A one-of-a-kind red sparkling wine made from 100% Syrah, combining rich flavors of blackberry, pepper, cherries, and a hint of tobacco for a dark and delicious treat that is all its own. This beautiful sparkling wine has not only caught the eye of Treveri’s customers, but it has also garnered national attention as it was served at the US State Department Holiday Receptions. Pair it up with a sweet and tangy smoked brisket, pork chops and grilled lamb chops. “Blanc de Noir” means, “white from black.” 100% Pinot noir adds a subtle touch of color and complexity, with a hint of strawberries and brioche on the nose. The rich acidity and creamy finish are great for pairing with fatty foods like smoked salmon, lamb chops with mint aioli and sea scallops topped with a raspberry compote. One of the world’s most aromatic varietals, Treveri Cellars’ sparkling Riesling boasts a delightful bouquet of apricot, peach, and a bit of honey, balanced by high acidity and a rich creaminess on the palate. Riesling grapes are on the rise in Washington state, and Treveri Cellars is the only facility to produce a sparkling Riesling, adding another dimension to a full line-up of award-winning sparkling wines. This wine is refined and semi-dry, rich in minerality and is accompanied by peach, apricot, and yeast on the nose. It would be tasty with a bitter greens salad, Tandoori chicken or poultry, and sweet & sour chicken. Pronounced GUH-VERZ-TRA-MINER, this wine has a storied tradition of a fragrant nose and tropical fruit on the palate. With our winemaker’s German heritage, a sparkling Gewürztraminer makes so much sense! Treveri Gewürztraminer was recently served at the James Beard Foundation in New York City. Notes of lychee, combined with rich tropical fruit, allspice, nutmeg, and clove are balanced with an underlying acidity for a true expression of the grape. Pairs great with Asian-style flavors, like balsalmic-glazed poultry, Thai curry mussels and Seafood stew with coconut. Just in time for Spring, we have a new rosé on the shelves! If you’ve never had a wine from the Finger Lakes region before, you’ll be surprised to see how good they are. Located in western/central New York, the area is named after 11 long, narrow lakes that resemble a handful of fingers (OK, maybe two-plus handfuls). And in turn, the lakes were named by the Native American Iroquois, the area’s original inhabitants. Lakes Seneca and Cayuga are the two largest lakes in the cluster, where most of the wineries are located. Even though wine was made here as far back as the 1800s, it wasn’t until the 1960s that farmers began to take the Finger Lakes seriously. There are now over 100 wineries in the area, on 11,000 acres: It’s the largest wine producing area in New York. The region is often compared to Germany, as far as climate is concerned. Sheldrake Point Winery, located on Cayuga Lake, has been in business since 1998. The 160 acre lakeshore site that is now Sheldrake Point Vineyard was operated as an orchard and dairy farm from 1850 until the mid 1980s. Owners Chuck Tauck and Fran Littin were attracted to the Finger Lakes wine industry during Chuck’s graduate work at the Cornell Hotel School. Together, they transformed the property into today’s winery and vineyard. a French wine grape (famous in Bordeaux and the Loire Valley) that is starting to show some fantastic results in the region. Normally used to make red wines, this rosé is made by allowing the red grape skins to sit in the crushed juice for two days, just enough time to extract that beautiful salmon/onion-skin color. The wine is floral and fruity, with an interesting herbal scent. It makes me think of orange peels, strawberries and sage. The sage/herbal smell is neat; typical of the Cab Franc grape when grown in a cooler climate. It’s zingy, acidic and lively, and you get this rush of tangy grapefruit, berries and even some minerals as it fades out on your tongue. As the weather warms up, rosés are all the rage, and rightfully so. They’re fun, refreshing and versatile (they’re also pretty to look at). Something light and zingy like this is perfect with appetizers and light fare. This would be great with a salad (add raspberry vinaigrette for additional wow factor), grilled veggies, light, spreadable cheeses, charcuterie, or my favorite: watermelon and arugula salad.